It’s a standard request. Whenever people ask for a restaurant suggestion in Paris, even before they open their mouth I know exactly what’s coming—they want a suggestion for a restaurant that: 1) Serves traditional French food, 2) Is budget friendly, and 3) Has no tourists. There are plenty of budget-friendly places to eat in Paris, like Chartier and L’As du Fallafel, but ones where you’ll find honest traditional French cooking are harder to come by these days. If you’re looking for the rare combination of good food and atmosphere, and modest prices, most of us have given up on the classic bistros and brasseries whose food slides deeper and deeper every year into the “lower than ordinary” category due to corporate takeovers. There are a variety of reasons, and as Alec Lobrano noted in his terrific book Hungry for Paris, “..”it was accountants, who edited the menus” that were often the most responsible for doing a lot of the great old brasseries in. And nowadays most of the food in them is merely passable, but hardly memorable. I do get a chuckle when tourists want to go to a restaurant that doesn’t have tourists. Considering Paris is the most visited city in the world, you’d have to go pretty far outside of the city to find a place completely inhabited by only native French people. (Perhaps a truck stop out on the peripheral highway.) And while it’s interesting what some of the younger, hip chefs are doing in Paris, it’s harder and harder to find places still doing cuisine comme la maison; home-style French food, the kind one often thinks of when imagining a classic French meal in Paris. So it’s with great pleasure when I send someone to A la Biche au Bois, which is slightly off the beaten path—just enough so visitors feel like they’re getting away from the Left Bank, and the food is hearty and honest French fare. You might find a couple of out-of-towners lurking about (c’mon, we’re not so bad, are we? ), but because this place slides under the nose of most of those restaurant lists that everyone clips and clings to, there’s plenty of French people in this boisterous bistro. 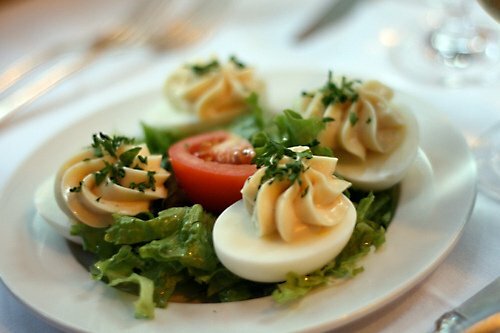 Few non-French folks would think of ordering hard boiled eggs with mayonnaise as a first course, but les oeufs durs mayonnaise is such a bistro classic that there’s even a society in France to preserve it and keep it on menus. The version here is one of the best I’ve ever had. If you’re looking for a boneless breast of chicken, or sauce on the side, A la Biche au Bois isn’t the place to request them. But they make a very respectable Coq au vin. In the dinged-up casserole, you’ll need to drag the spoon through the thick, dark sauce to pluck out a piece of chicken. And it’ll likely be a more flavorful morsel from elsewhere on the bird, which in France is one that’s been cooked close to the bone. 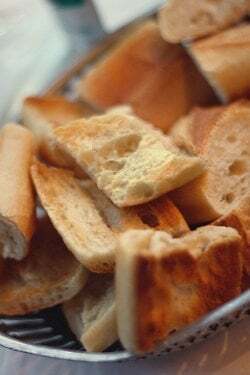 When you get a Salade Perigourdine, out comes a oval of foie gras ringed with fat, but with it comes with still-warm toasted slices of baguette whose heat melts the duck liver just a tad, enough to soften it and highlight its creamy consistency. 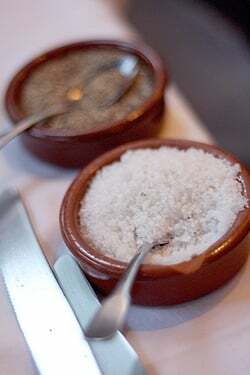 And no one appreciates it more when fleur de sel is brought to the table with it whose wispy flakes are the spot-on compliment to the rich foie. I always wonder why anyone even bothers to serve foie gras without it. What’s the point? And proof that gluttony sometimes gets rewarded, the second platter of frites was darker, and more well-cooked than the previous one. So I say it’s best to plan on ordering extra fries, just to be sure. Even before you’re allowed to look at the dessert menu, a board of cheeses jammed together are brought to the table; which may include chèvre rolled in black pepper, a bleu d’Auvergne, Pont l’Eveque, and a crumbly Cantal. 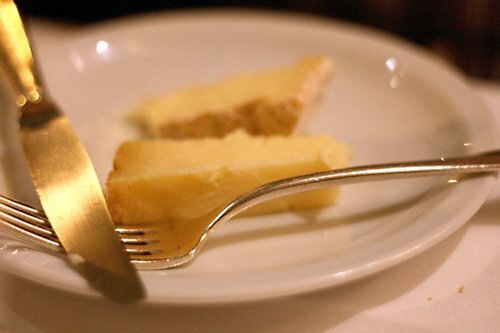 Desserts are standard French classics, such as crème brûlée, crème caramel, and all are made in house. A few offerings of ice cream and frozen desserts, like Poires Belle Helene (Poached pears with vanilla ice cream and hot chocolate sauce), are good if you’re feeling too stuffed for anything extremely rich. Having made approximately six-thousand four-hundred and eight-seven crème brûlées in my professional pastry life, I can’t say I ever order it in a restaurant. 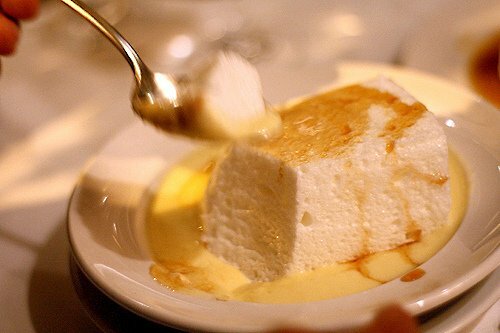 So I always pick Île Flottante, a poached meringue served on a pool of ice-cold crème anglaise with a dribble of sticky caramel sauce. I know a lot of people wrinkle their nose at it, but whenever I order one, I have to fend off the other spoons making a nosedive for my dessert at the table. So far, I’ve ticked two off the list: classic French food and not touristy. Then there’s the price. The fixed 4-course menu currently hovers under €29 and there’s a wide berth of things to order. In the winter, I suggest ordering any gibier (game) that’s on the menu, because they do it right. The servers are professionals but not jaded, or brusque. And I’ve never been here and not had a great time. If you’re lucky, you’ll be sent on your way with a complimentary glass of fiery eau-de-vie, that’ll help you digest everything. Trust me, you’ll need it. oh.my. 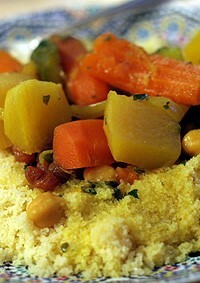 a la biche au bois looks and sounds absolutely delicious. especially that description of the duck liver slightly melting on the warm bread. ahhhh, can’t wait for my next trip to paris! thanks for sharing, david! Pardon me, I’ll read the text in just a moment… I’m busy at the moment *drooling* over those luscious photos. :) Sublime! ~m. Fantastic recommendation. It’s a real, true locals’ joint, but the sad truth is that quite a few tourists might wrinkle their noses up at some of these dishes. 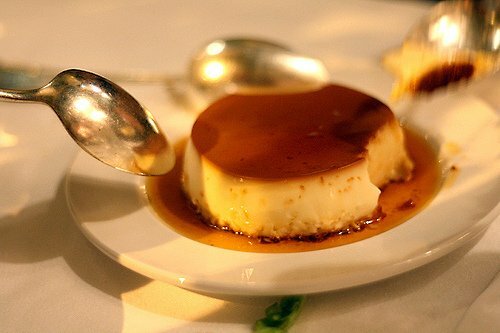 I am totally with you on the Ile Flottante too, what a great, underrated dessert. Just the kind of thing I order when I dine out precisely because I would never be bothered to make it at home. I’ve brought people to places like Le Petit Saint-Benoît, and they come out of the restroom horrified that’s is an old-style Turkish toilet. So although people say they want to go to ‘real’ places, I always have to do a little mental assessment before I give them suggestions. You have hit on the nail about “tourists” not wanting to go anywhere there are “tourists” as if they are better than the many other visitors who come to Paris. We have been to A La Biche au Bois and your post reminds me I have to go back when we are next in Paris. Thanks for the great description and pictures. We just got back from Paris couple weeks ago and I brought along several lists of your recommendations. The A la Biche au Bois will be the next trip. One list was the 10 things to bring from Paris. I usually don’t shop while there but this time I made an effort. I bought the Speculoos on the first trip to a supermarket. And I ate it with the spoon until I got sick. I didn’t even brought the rest home with me. It was soo good but with all the pates (foie gras, de lapin, etc.) I tried, my system gave up. What I did bring was the Biogaze, but I had to insist. The first pharmacy tried to sell me a box of ordinary sterile gaze and pretended that I, for sure, don’t know what I want. For those planning this purchase, if you don’t speak French, look for a word on the package that will remind you of creme bruilee. Not the creme, just the bruilee. Anyway, the rest of the things will have to wait for next trip. David, keep the suggestions coming. It was just wonderful. It was such a warm, boisterous atmosphere where people were enjoying each other and enjoying their food. The food was just as described. To us, it seemed like good home cooked traditional food. It really hit the spot on a cool fall day. I had the Coq au Vin, and my husband had the Steak Frites. The cheese platter was incredible. We only saw one other American couple while we were there (unfortunately one of those American couples that doesn’t even try to stumble through their order in French). Our “neighbors” at the table next to us got a kick out of our French and pleasantly poked fun at us off and on throughout the night, which made for a good time. The staff was incredibly friendly and patient and helpful. It made me wish that I could be one of their regulars! I highly recommend it. It was a wonderful date night in Paris for two newlyweds, and I think it would be wonderful for any other occasion as well! This place looks amazing! The Île Flottante, oh my gosh! So jealous you live near such a wonderful place. 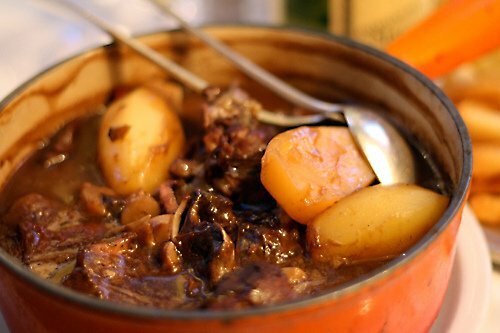 Coq au vin is one of my favorites and with the chilly weather we are starting to have here a nice steaming pot of it would hit the spot. You may have inspired my next Sunday dinner! Thanks for the tip, David! I’m looking forward to checking this place out. Those were the best fries that I have eaten in my entire life. I dream about them on a regular basis. You forgot to mention their lovely, fluffy potato puree. We asked for their secret and our own puree has gotten a calorie boost since…it’s butter, butter and did I mention butter? When we were there it was very crowded and we got the worst table (almost outside…in November), but the food and the staff really made up for it. We had a lot of fun with our servers! Oh dear, we’re going to Paris tomorrow for a long weekend… I’m afraid I’ll have some extra kilos on the return flight, and it’s not stuff packed in the luggage! Thank you for this suggestion! 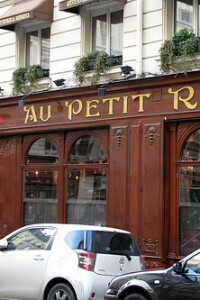 When I was last in Paris (May of 2009), I found this place in a review in a different blog. And man, was I so glad I went there. It’s so amazing–it’s the number one place I would go back to on every trip to Paris. I did end up ordering the oeufs dur mayonnaise as a starter and their coq au vin (and my friend and I couldn’t stop dunking the fries into the sauce…the sauce…ahhhh). We were so brutally stuffed by the end, but it was worth it! This post just made me really hungry! LOL. I appreciate it! Thanks for sharing the experience. The first dish really made my day! I think it would be great if the recipe will be posted here. I would love to see that. but anyways, the dish with the fries is tempting too! in Les Halles. Anyone been there recently? Hard boiled eggs would not be one of my first things to order anywhere, sorry. I find this very amusing, that there is actually a society to keep it on menus. Makes me smile, hey, but whatever. I think it is wonderful of you to recommend all these special places for all of us foreigners to go. I just send your link to a friend for some restaurant ideas. She is visiting Paris at the moment. So, Thanks David! Beautiful, I hope I get there someday! Until then I enjoy Paris through your insights! Thanks David! I’m bookmarking this for my upcoming trip! An why would anyone ever turn up their nose at ile flottante? Best dessert ever! Do you happen to have a good recipe for it? How funny, you really have pegged us tourist and our needs! I’m also bookmarking this post in my Paris folder, thanks for letting us in on this secret! OMG David you are a genius writer and a more genius photographer…… Sounds odd but I actually shed a tear over this post.. It is so beautiful.. I’ve got to get to Paris….in the meantime, any places like this is the states….New York specifically ?? Just asking… Some place where the tourists don’t go… LOL Thanks Dave.. Beautiful..
Oh, good lord. I’ve already had dinner and that was still torturous! We ate there on Tuesday and it was a fantastic meal. Gorged on terrine au lapin and foie in the salade perigordine then had coq au vin and our friend had canard. 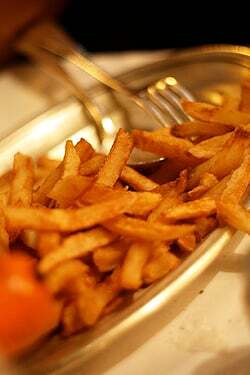 Pommes frites in duck fat for sure!! Loved the classic desserts – Ile Flottante and Pruneaux au Armagnac. Wine list is great and reasonable especially for certain vintages. Will return!! katie: Yes, my recipe for Île Flottante is in The Sweet Life in Paris. Hannah: It is funny, and I never know what to say. As if there are secret, “locals-only” places that no one has been able to discover. I think because a lot of guidebooks and such warn people away from places with menus translated into English and so forth. True, there’s a lot of lousy tourist traps but a lot of very good restaurants also have English menus simply because it’s easier for the staff as well as the customers. And it is the language a majority of travelers speak. But it’s also because some places only have one English-speaking server & it’s easier to lump us all together. Also if people want to dine with the French, they should avoid the first seating in restaurants and eat later, like after 9pm. Jeena, Mariangela, and Natasja: Glad you like the place, too. I can’t go as often as I like because the food is so rich. But it is a fun time, especially in the winter with all the game on the menu. Oh David, now I am so torn…A la Biche au Bois or Spring. I suppose fate will have her hand with me as the calls need to be made today. This was a lovely enticing post and came at a providential moment as I am at Slow Food’s Terra Madre in Torino now, but will be going through Paris next week. I love how you describe your experience and how the food makes you feel because ultimately that is all “of a piece” so to speak. The tricky part is to imagine how you will be feeling one week’s time from here. What will you been yearning for?…comfort…something light…or something else all together. Thanks for this. My Parents bought a house in the South West of France over 30 years ago. I spent every holiday there, and still do. Île Flottante is one of my happiest memories. Sitting in Noel’s french farm house kitchen as she pours fresh cream and milk from her dairy into the custard. It was utterly delicious.. as are my memories. WOW! For some crazy reason I took French in H.S. instead of Spanish! I live in So. CA. No, I can’t speak it (without slaughtering the beautiful language) but I can understand bits and pieces! Enough to get me into trouble (OK I’m 48yrs old!) does anyone really remember anything they were taught in H.S.? My in-laws have taken my oldest son to France……and they had a GREAT time……they are looking to go back again and take my youngest son with them!! IN-LAWS are wonderful when they don’t have children of their own and have 2 professional incomes! My husband and I can’t afford trips like this, so they “borrow” our kids and show them things we can’t do! It’s a WIN/WIN situation. I am going to have to forward your site to my Sister in Law……she will LOVE your recipes and especially your insights to France! Thank you so much………you’re the BEST! eaten only when lying on the side on your plate because of its vanilla filling. There is nothing like it and the best ones in Paris are found in the absolutely touristfree area of the gorgeous Buttes Chaumont park and theupper Belleville area easily reached by bus (96, 48, 75,26 ) or metro 10, 7b (Place des Fètes). The patisserie with the gorgeous millefeuille is just by metro Jourdain and a church suitably named La Patisserie de l´ Eglise. This is in no way outside of Paris but the Paris of the 19th and 20th arrondissements high above the rest of the city indeed 80 meters above the Seine. Do discover the Paris of the truly blessed Parisians. Oh, I love this place! I made the mistake of ordering the salade Perigourdine AND a magret de canard with foie gras sauce AND somehow eating half of my sister’s chips on a 33+ degree day (plus half a delicious bottle of rose)… I seriously nearly passed out; I had to rest my head on the table for a full half hour. What higher recommendation could I give? 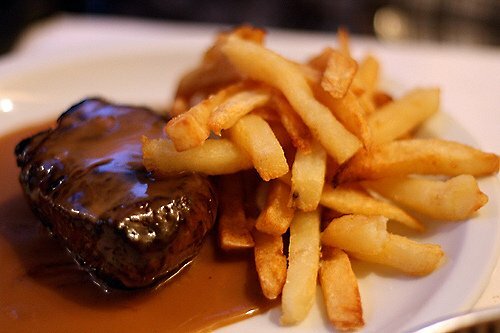 Mmmmmm……I have been living in Paris and only went to Biche au Bois once because it is a little off the beaten track. But I am definitely ready for an encore….Ile Flottante is calling my name. A chef friend of mine told me that I have to experience the Paris Brest at Bistro Paul Bert. Maybe you have tried it? And thank you for the tip on dining a bit later in the day to avoid more of the tourists. Living in Spain for the past month and a half has definitely pushed my dinnertime back several hours. :D I´m looking forward to eating at A La Biche Au Bois. PS, Would you recommend making reservations ahead of time? When I saw today’s entry I just cringed! Why do you have to share all the secrets AGAIN?!? Was it not enough to have put this gem out there in your restaurant suggestions?! Oh, well, I guess we should share the love. It is truly cuisine comme la maison. Vraiment! All kidding aside, this was the highlight of our meals during our trip last year. I had the most unbelievable celery remoulade that still makes me weep. And the cheese tray… and my lamb…….all epic and oh so memorable. We loved our waiter who was German but had lived in France for many years. He spoke to me in French, to my non-French speaking husband in English, and to my then 5 year old daughter in sweet little hushed tones about sorbet and le dessert. A true gem. Just like you!! I am not mad any longer. And the previous poster does make a good point – will all these spots become the next “David Lebovitz” phenome? Like the sweet little restaurants in Tuscany before the hoards of book carrying Rick Steve-ites? Hmmmm. When I am in France or Italy now and see people at a restaurant or standing in line with some version of “Through the back door”, we hit the road. Not that I don’t appreciate his books……..
Ooo la la j’ai l’eau a la bouche! This post was pleasure (I can almost taste it) and pain (I am not going to taste it anytime soon) rolled into one. Now that I’m in Seattle, far from my French mom’s cooking which is exactly like the photos and descriptions, I miss it so much. Indeed every time I go back it is harder and harder to find these nice little gems that used to be so prevalent. Have you gone to the Le Creuset factory up north? In that nearby “parc industriel” there is a similar place where a lot of guys in blue worker coveralls line up and the food is amazing and reminiscent of the glory days of bistro fare. My husband always makes fun of me for wanting eggs with mayonnaise or tomatoes filled with mayonnaise shrimp salad as a starter! It is toujour un plaisir to read your posts, thank you very much, because it perfectly satisfies my Franco American hybrid view of the world. Now that I have two kids, we are planning to move back next summer so ma maman can make them appreciate les oeufs a la neige et les clafoutis just like my childhood! Hopefully there will still be plenty of non-corporate little gems to enjoy regularly with them. Sounds like a good find! I’ll go and try it next month! One of my favorites is just nearby there – Pause Cafe, 41 rue de Charonne near Bastille. The food is consistently good, tasty, nicely presented, and my boyfriend and I have never been disappointed! Another hidden little resto that fits the bill (traditional French home-cooked food, no tourists) is Le Tire Bouchon (5 rue Guillaume Bertrand 11th arr). It’s just the owner, with his huge handlebar mustache, one spunky waitress, and one cook. Though on weekdays, I was there when the owner was the one cooking. 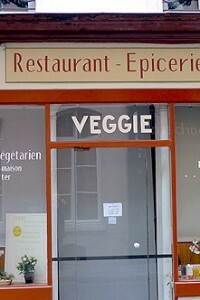 The food is southwest French and very honest. 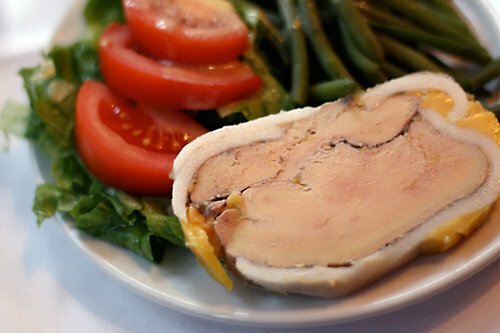 Nothing fancy or extraordinary, but good French food at a low price. Plus the place is funky, filled with French tchochkes everywhere. Oh my! 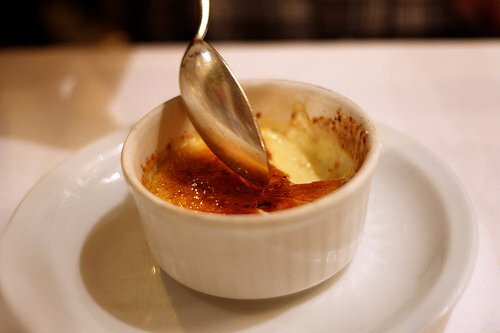 Totally drool worthy photos David ;) I doubt if I’ve clocked up quite so many crème brûléesÎ’s in my time in the kitchen, I know what you mean about them loosing their little charms after awhile. The le Flottante sounds heavenly. Wonderful post & can’t wait to get to Paris again soon. How I wish Paris is just a train ride away. The description of the dishes is driving me crazy! This sounds delicious, I’ll try to go there soon! One question though, I happen to be one of the difficult kind of clients who doesn’t eat meat (only fish and seafood), allthough I’m not sure how long I can remain that way now that I’m living in Paris (not that I can’t find a good variety of seafood dishes, but honestly I’m really starting to find it hard to resist the variuos meat products and dishes…) so does this restaurant serve any fish/seafood dishes? Love your site, especially usefull since I moved to Paris! 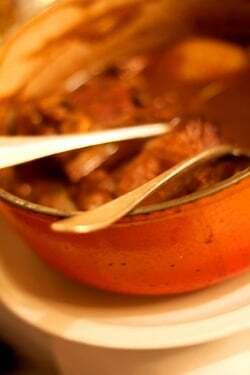 Have you ever been to Les Bougresse at 6 Rue Jarente 75004 Paris? My partner and I ate lunch there this past September while visiting Paris and it was among the best meals of our entire trip! Delicious and beautiful, the food was French and the flavour, amazing! I cannot recommend it enough. Ohhh, beautiful post! BTW I tried the chocolate chip mesquite cookies and a huge thank you for that one. Beautiful smoky aftertaste that take them from ordinary to sublime. Don’t suppose you have any recipes for turkey with Thanksgiving on the horizon? My husband and I have a little case of chef worship going on here, “If it’s David’s recipe, it must be good”. Sometimes I think the touristy places have to be fairly good because there is so much competition. Even on the tourist-trapped Champs Elysees, I had a mile-high pot of mussels that I remember fondly. Oh my god, I remember, I used to go there 20 years ago when I was working for IBM which was located not far from there. Amazing, looks like I should go back. Thanks foir your post and I love your pictures. Madeleine: That’s an interesting question because I would say over 95% of the restaurant requests are for people looking for ‘budget-friendly’ places. I generally don’t go to too many upscale or expensive places because they’re not really my thing and I find the food and ambiance in smaller places like this more to my liking. Plus when a meal is €30, I feel that it’s okay to recommend it. But when it’s €100-€400 pp, since I’m not a restaurant reviewer (I don’t go 3 times nor do I go back and update most blog entries), places and tastes change and I would hate to have someone go somewhere that wasn’t good and spend all that money. Sofia: I like that area a lot too, although it’s gotten trendy and expensive. There are a few good places to eat over there, but I had the worst croque monsieur of my life at a place that used fluffy white bread (like Wonder Bread), and I felt embarrassed they even sent that out. But the market is great and there are so other finds there as well. Isabelle: No, but I’d love to know what town that is in. Sounds great! I took your advise and checked out the shops and restaurants dotting Rue Cler, a stone’s throw from my hotel window. I ate there last night at the locals’ fabo haunt, Cafe du Marche. The confit de canard was the best I’ve ever had. A symmetry of perfectly crisp skin and fall-off-the-bone succulent leg meat sided by pan fried (in duck fat, I’m guessing) potatoes and a lighted dressed bib lettuce salad (to take the edge off, I’m guessing, all those hip-hugging calories), all for only 11 euros! Did I mention their strawberry mojitos? Thanks for the A la Biche au Bois head’s up. I’ll check it out next time I’m in town. Thanks for the delicious photos. Fries and more fries…that’s so my thing. I have a question about the oeufs durs mayonnaise. The picture here looks kind of like a deviled egg, with the yolk made into a filling. The picture and recipes I’m seeing online show hard boiled eggs, sliced in half, with mayonnaise topping. Is the picture here just a piping of mayo on top of the egg? Is the mayo flavored or herbed? I’m so curious as I love eggs and I’ve never eaten them in France except for in omelets…and the various egg white desserts, of course. About a decade ago I went to Paris with a girlfriend for ten days. This was an uber budget trip. We were really travelling on the cheap. The thing I was most worried about was the cost of food since I’d heard so much about how expensive Paris is to dine and enjoy. Yes, I ended spending more on meals than I thought – but it was the most amazingly enjoyable part of the trip. The food was so incredibly delicious even at the littlest hole in the wall bistros. The smooth, rich sauces. The intensely pungent flavors. The velvety red wines. I was blown away. And, I was positive when I got home I would’ve gained weight even though we did a lot of walking. Not so, even with a pastry and tea in the afternoon I lost three pounds. David, I live in Paris too and this is by far my favorite restaurant. Some of my friends laugh at the fact that my favorite isn’t one of the “hot now” trendy spots, but nope. The food and the service are well worth the little trek for me. I haven’t been in a couple of weeks, and this post is making me wanna go now!!! Hi David- L’usine Le Creuset is in Fresnoy Le Grand, and in fact their big annual “braderie” is coming up sometime end of November I think. Can’t remember how to get to the little eatery outside the parc industriel, but the employees at the store surely can direct you if it’s still open and still as good. Other note: I love that you don’t review high end restaurants as much, by the way, contrary to some readers. Those shiny high end places get plenty of coverage and it’s easy enough to find reviews and blogs all over the place that cover those. But it’s a treat that you cover the true gems of la bonne cuisine, places of real interest not purely because they have a star chef or a star clientele or a zillion sous chefs to prep and polish. Merci for that. I could just eat your photos! Living in Trinidad (Caribbean) the closest we get to Paris is Martinique (and that ain’t no Paris) so I love to get a slice or two from your site! Thanks for sharing! Hi David – thanks for reminding me of this little gem. I haven’t been there in six years or so and last time I went it was with our friend Mr. Yonan. If I recall, he wrote a short piece for the Boston Globe on my kidney dish that was almost the size of a small telephone (land line, not mobile!) It was a swoon-worthy meal. I’ll be back in Paris in a few weeks and thanks to you I’ve just made a reservation here so I can bring back the memories. I can’t imagine a better place to be in November – good call! Hope you are splendid – no wait, you ARE splendid. Keep up the great work, your blog keeps me going. Loved it! Couldn’t help myself and went there twice last week. And even though (on the first night) the American woman on my right was describing this very blog entry of yours at length to her American husband, the French chef (who had just sold his restaurant around the corner) dining with his Algerian fiancee on my left kept the evening far from touristy. In the end he was softly singing love songs while polishing off my Grand Marnier-topped chocolate mousse. I wanted to take a picture of this couple but my Belgian date advised me that this would venture too far into American behavior for him to partake, so I reconsidered, allowing him save face and just drunk in the last of a most perfect dining experience in Paris. We discovered Biche in 1999 (our hotel was in the south end of the 11th & it was listed in “Cheap Eats in Paris”) & have been back at least once every trip since, last in 2007. Glad to hear that it’s still a great place. Hope to return in 2011. Bertrand & Celine run a great restaurant. We like to book our table early (American style) when the place is still mostly empty, gives us a chance to visit with them. By the end of our meal, every table is filled & they are rushing madly about.